Sir FredrickTreves : The Other Side of the Lantern, 1905. The Other Side of the Lantern- An Account of a Commonplace Tour Round the World. 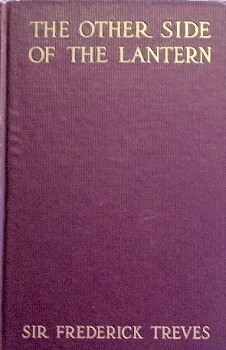 With forty illustrations from photographs by the author. Cassell and Company, London, Paris, New York and Melbourne, 1905, pages 407 and 408. Fredrick Treves wrote this evocative description of surf bathing at Waikiki following his visit on a world tour in 1904. Beginning high on the Pali, his broad perspective progressively reduces to a bather swimming towards the outer reef. "the high wave ... as it sweeps along, hurrying and hissing, the summer wind blows a mocking spray from its angry ridge ... curling to break, its walls stand up green, smooth, and polished, like a section of a great glass tube." Treves is partial to quoting from English literature, in this case with quotations from Romeo and Juliet, Alfred Tennyson, and Rudyard Kipling. The Other Side of the Lantern was a popular book and it was subsesquently reprinted in numerous editions. Frederick Treves (1853-1923) was a famous surgeon, performing the first appendectomy in England, on 29 June 1888. In June 1901, he performed the operation on, the then monarch-in-waitng, King Edward VII. He is also known for his assistance to Joseph Merrick, known as the Elephant Man. He published several accounts of his travels, but the majority of his books are scholarly medical works. The Other Side of the Lantern was a popular book and it was subsesquently reprinted in numerous editions, including 1908, 1910, 1912, 1913, 1916, 1918, 1925,1928, and 1931. Sir Frederick and Lady Treves arrived in Honolulu on the Sierra on the 20th May 1904. - The Hawaiian Star, May 20, 1904, page 3. 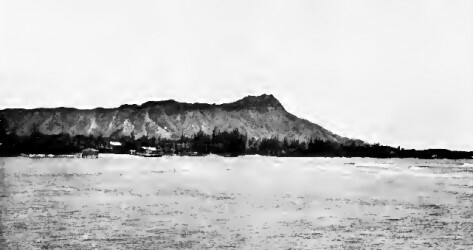 In February 1907 the Honolulu Promotion Committee noted that the Canadian Pacific Railway intended to reproduce in their in-house magazine "Sir Frederick Treves' splendid description of the Pali and bathing at Waikiki." - The Hawaiian Gazette, Honolulu, February 15, 1907, page 5. Mercutio: "No, 'tis not so deep as a well nor so wide as a church-door, but 'tis enough, 'twill serve.."
- Shakespeare: Romeo and Juliet, Act 3 Scene 1. "The scream of a madden'd beach dragg'd down by the wave." - Alfred Tennyson:Maud, III, 1855. "Maud and other poems was Alfred Lord Tennyson's first collection after becoming poet laureate in 1850, published in 1855. Among the 'other poems' was 'The Charge of the Light Brigade', which had already been published in the Examiner a few months before." "girth deep in hissing water,"
To right and left the immense black precipice extends in front and far below is the immeasurable plain. The plain is green with every tint of green â€” apple-green, olive-green, the green of old bronze, the blue-green of old pines. There are little hills on the flat upon which one looks down as would a soaring bird in the sky. On the border of the plain is a glorious bay open to three thousand miles of sea. Its beach is a curve of dove-coloured sand which alone divides the green of the island from the blue of the deep. The sea is iris blue, so calm that masses of white cloud are reflected on its surface, so clear that there can be seen the streak of mauve which marks the submerged coral bank and the splash of amber where is a fathom-deep meadow of golden weed. One great joy of Honolulu is the sea-bathing, for nothing can surpass it. ... serve," but they fail to approach such bathing as can be found in the cove which lies in the shelter of Diamond Head. The day is hot and tiring, while the roads and the bare heights seem famished by drought. The sea is grey-green and glistening in the sun. The heated man plunges into it and swims out, with panting eagerness, towards the coral reef. The water is soft, silken, and caressing. His hands, as they move forward at each stroke, look already cooler under the ripples. The sea dashes upon the reef with a thundering roar as if a white-crested multitude were storming a long trench. Within the reef the high wave rolls shorewards. As it sweeps along, hurrying and hissing, the summer wind blows a mocking spray from its angry ridge. As it nears the swimmer it is curling to break, its walls stand up green, smooth, and polished, like a section of a great glass tube. Through it he can see the light in the sky. He dives into the rushing comber and comes up into the sun on the other side of it. It tears past him to the beach with imperious hauteur, leaving in its track a dazed waste of white foam which is whirled into circles by bewildered eddies. Then comes "the hurl and the crash " upon the sloping shore, and, after a moment of hush, "The scream of a madden'd beach dragg'd down by the wave." coral reef towards the shore. Beyond the surf on the reef are the untroubled sea and a black-hulled schooner sailing away to the uttermost island. If the swimmer turn landwards there are the biscuit-coloured beach, a thicket of palms, with a brown thatched house in its shadows, and behind a line of purple hills which shimmer in the heat. Cassell and Company, London, Paris, New York and Melbourne, 1905. Geoff Cater (2012) : Sir Fredrick Treves : The Other side of the Lantern, 1905.